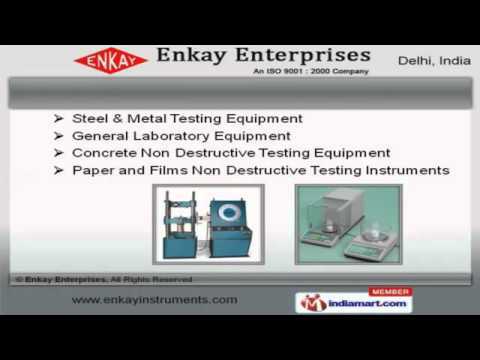 Welcome to Enkay Enterprises, Manufacturer and Exporter of Material Testing Machines. We are an ISO 9001:2000 and 14001:2004 certified company, established in the year 2006. Transparent business dealings make us unique in the industry. Assured quality products, large production capacity and Flexible payment modes make us the first choice of our clients. We offer a wide assortment of Soil, Rock and Concrete Testing Equipment. Our Cement, Sand and Asphalt Testing Equipment are best in the industry amongst others. We offer Steel and Metal Testing Equipment that are available at industry leading prices. C N C and Spring Testing Machines offered by us are acknowledged for their functionality. Along with that we offer Metallurgical Microscopes and Product Services that are a class apart. We also provide Core Drilling Machine for Construction Industry that are extremely reliable.